in power, tired of the constant protesting. "Shall we die for Ukraine? … That Ukrainian president Poroshenko and his government are now talking about an invasion does, of course, have a political backdrop: He wants to involve the West in the conflict. … The European Union and the United States should not oblige him. … The big question of course, remains whether Putin will be content with federalization, the destabilization of Ukraine and a genuine political voice, or whether he wants to completely destroy the country. At the same time, it must be said openly and with complete candor: the West would not and could not prevent this through military intervention." Shall we die for Ukraine? This sinister question was already made this spring in Western capitals, after Russia annexed Crimea, first with the help of separatists and covert forces, and eventually with regular troops. No one responded to the question with "yes." Rather, Germany joined by other Western governments categorically ruled out a military response to Russian aggression from the start - for good reason. Because it was and is clear to every responsible politician that a military conflict between NATO and Russia in and around Ukraine could quickly draw all of Europe into a war - 100 years after the start of World War I, which also broke out over territorial disputes. Nothing will change, one hopes, now that the Ukrainian government is talking about a Russian invasion in the eastern part of the country, and independent observers are registering columns consisting of thousands of soldiers and military vehicles from the neighboring country. Without a doubt, the war in east Ukraine is escalating. For months now, Russian militants and elite troops alongside separatist fighters have been battling the army and Ukraine's national cohesion in an undercover mission - both clearly with Russian military assistance and advisors. So the invasion essentially began a long time ago. Except that up to now, the government in Moscow always denied it. Now, however, it is increasingly clear that Russian troops are not only bombarding their neighbor, they are operating there almost undisguised. However, this development is hardly surprising. For weeks, the Ukrainian army has been bombing cities held by the separatists and had successfully pushed them out of some areas. 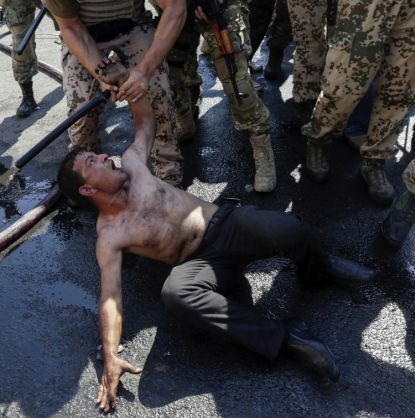 However, it was clear that Putin wouldn't stand idly by while the pro-Russian fighters he armed were defeated. So he has quite obviously arranged for a counter-offensive. And since the separatists, despite all of his support, could not withstand stand resist the advance of the Ukrainian army and allied militias, Putin is now sending his own soldiers without camouflage. In this way, step by step, the covert war between the two neighboring countries is becoming an open war. Putin can afford to do this, because he knows that the poorly-prepared and under-equipped Ukrainian army has nothing to oppose his own army with, and the West will not come to its aid. That Ukrainian president Poroshenko and his government are now talking about an invasion does, of course, have a political backdrop: He wants to involve the West in the conflict. The European Union and the United States should not oblige him, because this still applies: There is no military solution to this problem, only a political one. Therefore, the West has no choice but to ramp up the pressure on Russia through sanctions until they begin to have an effect, while at the same time seeking a dialogue with Putin. In the end, one way or another, a negotiated settlement will have to be reached - among Kiev, Moscow, the separatists, and the West. The result, given the situation and the division of the country, can be none other than more-or-less strong autonomy for eastern Ukraine and its Russian-speaking population, and links between Ukraine and the E.U. as well as to Russia and its Eurasian Economic Union. Initial steps toward roundtable discussions mediated by the OSCE (Organization for Security and Co-operation in Europe) have already taken place. With its military offensive however, the Kiev government has rendered them void. The big question of course, remains whether Putin will be content with federalization, the destabilization of Ukraine and a genuine political voice, or whether he wants to completely destroy the country. At the same time, it must be said openly and with complete candor: the West would not and could not prevent this through military intervention. It would be different, however, if Russia were to attack a NATO country like Poland or the Baltic States in the same or similar manner. Then the Western Alliance would be obliged to act. But from this we are - hopefully - far away. 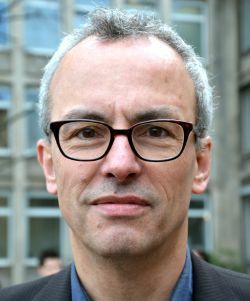 *Ludwig Greven, has been political editor for Zeit online since March 2006, working primarily on the future of Europe and ways out of the euro crisis. In addition, on other issues like integration, demographic change, and the political parties. Previously online reporter for the Financial Times Deutschland and head of political issues for the (defunct) weekly Die Woche.